A powdered meal replacement that mixes easily, tastes great and contains 7.3g of fibre and with high quality carbs. 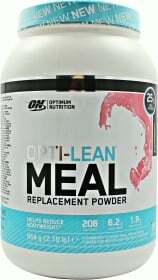 Have a question about Opti-Lean Meal Replacement? What is it, what does it do, how and when to use or something else? Ask us. This shake can be consumed anytime to substitute a main meal and contribute to weight control. Substituting 1 shake for 1 meal supports weight maintenance, while substituting 2 shakes in place of 2 meals contributes to weight loss. WARNINGS Opti-Lean Meal Replacement : The shake should be eaten in conjunction with a healthy balanced diet throughout the day.